Tomorrow, the 1st of May, I will attend a big celebration at Crama Stirbey as I received an invitation from their winemaker, Oliver Bauer. They are celebrating 6 years from the rebirth of Crama Stirbey . I am very excited about it and looking forward to re taste their wines. I have also received a promise to try again Feteasca Regala Genius Loci 2006 and 2007 as a comparative tasting. The Genius Loci 2007 is bottled but the winemaker chose to wait at least 6 months time before putting it for sell. He confessed that he did learn from his mistake in the past when he started selling Genius Loci 2006 too early. Now the 2006 has evolved into a complex and beautiful white wine. Last year when I tasted the 2007 while still in the barrel I found the wine more concentrated, richer and focused than the already excellent 2006. So I believe 2007 will be a big white wine. If things will be similar to last year I will probably have the chance to participate to a vertical tasting as well. Stay tuned as I will write a full review of the tomorrow’s event. As you probably know by now, if you read my blog and About me section, I am trading on the international stock markets. Greece was downgraded by Standard and Poor agency to junk – meaning that investment in this country is seen extremely risky. Portugal was also downgraded yesterday by the same agency. This affected the international markets as a high magnitude earthquake creating pressure on investors to sale and so markets dropped significantly. Yesterday was an awful day for some and an extraordinary day for others. I was in the second category. So as I said, I had an amazing day at the office. 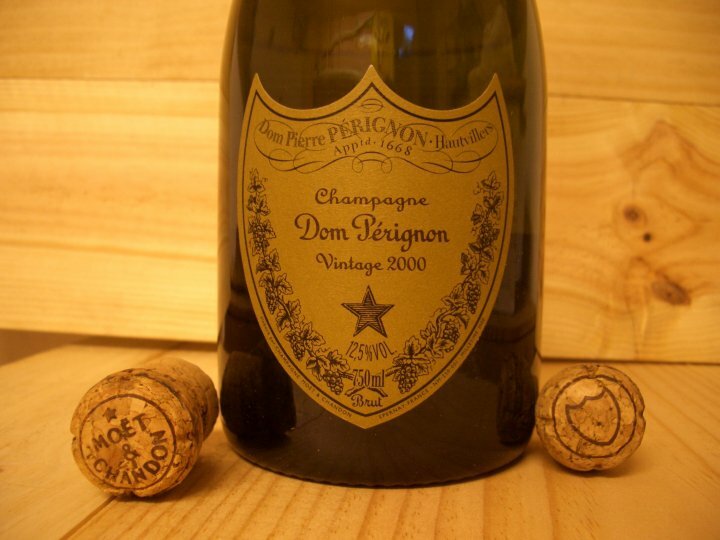 Therefore I felt compelled to celebrate and what better moment could I find to open a big classic like Dom Perignon Vintage 2000 on a TUE evening. I started with a regular Moet&Chandon Brut Imperial just to warm up. The color is clear pale yellow. The nose is subtle: floral with citrus notes, lime, hints of butter. Palate is delicate, well-balanced, a medium-bodied Champagne with nice fruit and toasted flavors. This wine is supple on the palate. Good sparkling but not great. Price level 30€. I cannot recommend you to buy it as you can find better entry level sparklings probably for less money. Plus it is my conviction that Moet Chandon is a little bit over rated. It’s a mug’s game to chart the maturing pattern and eventual ranking of any vintage of Dom Perignon too early in its life. DP shows its full splendor only after a period of 15 or 20 years, due to deliberately reductive wine making and the intricate blending from top-flight vineyards. Not as famous as 1998 vintage, the 2000 is nevertheless an impressive wine. I am not a fan of sparkling wines but I fancy a good one from time to time. This was a treat. The wine has a clear gold color. The bubbles are very smooth. The nose is initially closed but with aeration it evolves towards citrus notes, honey flavors, brioche, yellow apples, white flowers and walnut. The overall nose is fresh and vibrant showing great complexity. In the mouth the wine is clean and creamy on the palate with very nice mineral flavors, hints of apple, vanilla flavors, yellow fruit, a little bit buttery with very pleasant acidity. The finish is dry, long and as time passed the wine just got better. What impressed me at this wine is its perfect balance, how easy to drink and smooth it is. The best sparkling I had so far. Excellent wine. As much as I loved it, due to its premium price, I wouldn’t recommend you to break your piggy bank and spend the money on it. This is more for special occasions than anything else. I love a quiet SUNDAY morning with hot coffee and without the rush of reaching the office by a fixed hour, usually very early. I like to spend quality time with my better half planning the new refurbishment of the house and trying to figure out how to find a good and reliable working team for that. I think that is as easy and possible as finding a free parking place in Piata Romana at noon: it is really about one’s luck. This SUN we invited over our friends Crina and Catalin for a group cooking session. The menu was very simple and easy to make: grilled chicken stuffed with orange, asparagus and mash potatoes. I am sharing the menu with you not because is something fancy, but to give you an idea of why I chose the wines we had: a white Torrontes from Argentina and a red Romanian Cabernet Sauvignon. Torrontes became the emblematic white wine of Argentina. I believe Argentina is the only country to produce it and therefore it is considered a wholly Argentine variety. One variety that is inexpensive and delivers great pleasure. This bottle of wine was 8€. The bottle represents the entry level from Mauricio Lorca bodega. He is chief winemaker at Enrique Foster and formerly of Chilean-owned giant Finca La Celia, Catena, and Luigi Bosca. He creates his own wines using grapes from high-altitude vineyards in Vistaflores, Uco Valley. This wine has a clear medium lemon color. The nose is clean, youthful, with medium intensity of peach, flowers and orange citrus fruit. It has a beautiful structure on the palate, a very pleasant acidity, lots of fruit and floral flavors, mangoes, rose petals, plenty of body for a wine with such delicate aromas and flavors. The wine is quite dry even if it leaves the impression of some sweetness on the finish. Good. I read a very interesting article this morning published by Financial Times-FT.com wrote by the famous Jancis Robinson on Hungarian wines. It seems that “Hungarians are so proud of their viticultural heritage that they are prepared to pay high prices for their best and/or most famous wines, which tends to make them seem overpriced outside Hungary. The same phenomenon curbs exports of the new generation of much-improved wines from countries such as Greece, Turkey, Israel and Mexico – and even makes the top wines of Spain difficult to sell abroad.”. Full article here. I believe the same applies to Romanian producers and their wines. It is the case for the red wine we had from Nachbil as our second choice. I tasted several wines from this producer last year: Shiraz 2003, a nice complex wine, Chardonnay 2003 very similar to a good Chablis from Burgundy. Shiraz 2004 and 2005 were big disappointments with very light aromas and pretty much no aftertaste. The wine has a pale clear red color. I decanted this wine for about 1 h. The nose reveals aromas of red cherries, smoke and tobacco. Unfortunately they are overpowered by alcohol. In the mouth the wine has a light to medium body, medium acidity, showing discreet notes of blackcurrant, violets and black cherry. The wine finishes with light aromas of blackcurrant and some slight bitterness in a short aftertaste. I find this wine poor and overpriced,considering the 60 RON price. For the same price Hyperion 2006 Cabernet Sauvignon is a serious competitor. – Have you had Torrontes so far and how did you like it ? I attended THU evening, April 22nd, a tasting of three wines from Vinarte organized by La Chambre . For those of you not familiar with this name, La Chambre is a wine store in the Dorobanti area with a great selection of wines from South of France – Languedoc and South of Rhone- and many other Romanian and New World wines. The shop had a representative of Vinarte present for the event, but unfortunately he did not provide too much information about the products tasted. It’s true we came later than the starting hour of the tasting, my group of four persons, so we probably missed the presentation of the wines. I just had to read the back label myself for information about the wines or the producer. 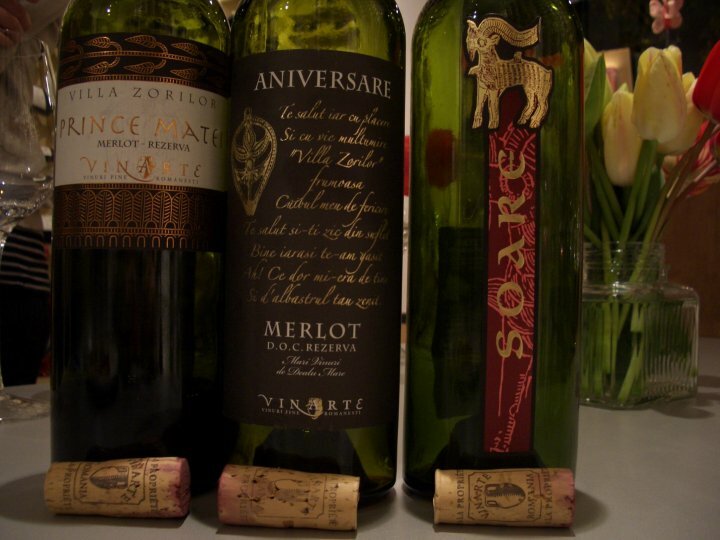 Prince Matei 2006 Merlot – did not leave a strong impression. The wine has a ruby red color with some discreet dark notes. The nose shows some black fruits, mint with the oak nicely integrated. The wine spent 12 months in oak and another 12 months in bottle before being released on the market. In the mouth the wine is medium body, showing some fruit, different black berries and spices. The wine finishes with a certain astringency in a short aftertaste. Aniversare Merlot 2006 – The wine has a very nice dark red with purple hues color. Among the wines I tasted so far, generally speaking, some had a tight nose and not revealing anything but then exploding in the mouth with a nice aftertaste, others having a big and complex nose and quickly disappearing in the mouth. Aniversare is just like the latter. The wine has a killer nose. After smelling this wine you are getting ready for a serious ride. The nose reveals notes of plums, chocolate, Indian spices, cocoa, blackberries and a balanced note of integrated oak (the wine spent 12 months in oak). In the mouth the wine is medium body, showing integrated oak, black fruits, blackberries, chocolate but disappears on the mid palate. The wine is hollow exactly when you are expecting it to balance that amazing nose. The aftertaste is short to medium. I was really disappointed that in the mouth the wine could not deliver the same complexity as in the nose. I believe it is already the third time I have this wine this year and each time I tasted I got exactly the same impression of the wine vanishing on the mid palate. Good but not great. Castel Soare 2004 – Just like the other two wines, Soare spent 12 months in oak. The producer doesn’t mention what kind of oak they used for aging on none of the three bottles. The wine has a dull red color with some slight notes of oxidation. The nose reveals blackcurrant with hints of green vegetables, leather and a very nicely integrated oak. In the mouth the wine is light to medium body showing blackcurrant, cedar, violets and leather. The wine has a short to medium aftertaste finishing without any astringency which I really liked. It is a good but not great wine. One of the girls present at the tasting confessed that she usually expects more from a Cabernet Sauvignon of this level and frankly, I agree with her. As a conclusion on the wines: I was surprised how different the two Merlot’s were. I don’t know if these two wines are produced from grapes harvested from the same area or different as both wines are aged for the same 12 months period in oak. The gentleman present for the event from Vinarte did not explain this. The WOTN (wine of the night) for most of the people present at the tasting was Aniversare Merlot. For me, that would be the wine I would buy from Vinarte. 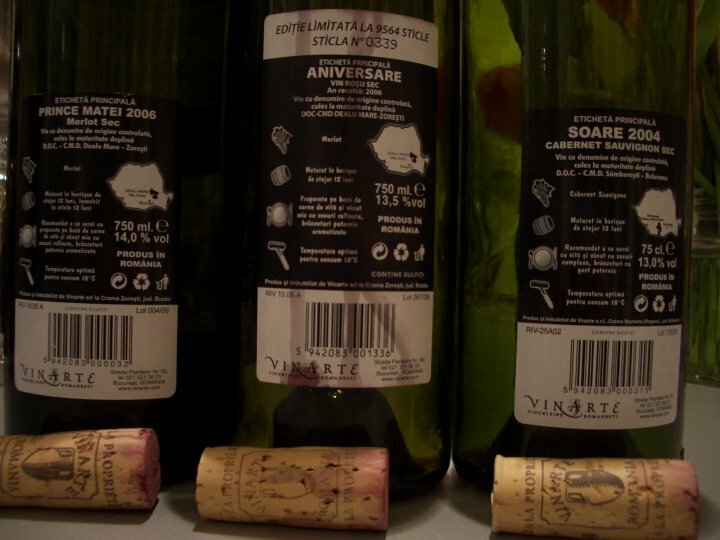 The question that remains for VINARTE is where did the art for making wine go? I am an optimist. I believe that any apparent misfortune hides an opportunity or something that will be revealed to us at a later date even if for the moment the situation may appear bleak. I am very sorry for all the people that got stuck in airports around the world, not knowing when they will return to their homes and see their loved ones and I do hope that things are coming back to normal as soon as possible. One of this people that suffered from the traffic jam was also the winemaker from Enira, Marc Dworkin. I had some conversations with Marc via email and social networks but never had the chance to meet him in person. So TUE, on the 20th of April, as Marc got stuck initially in Timisoara for 3 days and returned to Bucharest by car, we finally managed to arrange a meeting for lunch. We met in a nice restaurant in the Dorobanti area and I had the chance to find out very interesting things about Enira wines, the people in the wine business, how small this world is and also a little bit about Marc Dworkin, the person. First of all, it is important to know that Marc was mentored by Mr Michel Rolland, in my opinion, the most famous flying winemaker ever. They started to work together in 1989 and their collaboration lasted until 2003 when Marc started on his own. He is speaking with respect about his mentor and friend. I believe, even it wasn’t discussed at the table, that there is a competition in Bulgaria where the student is looking to surpass the mentor, as Mr Rolland is also consulting for a vineyard there. 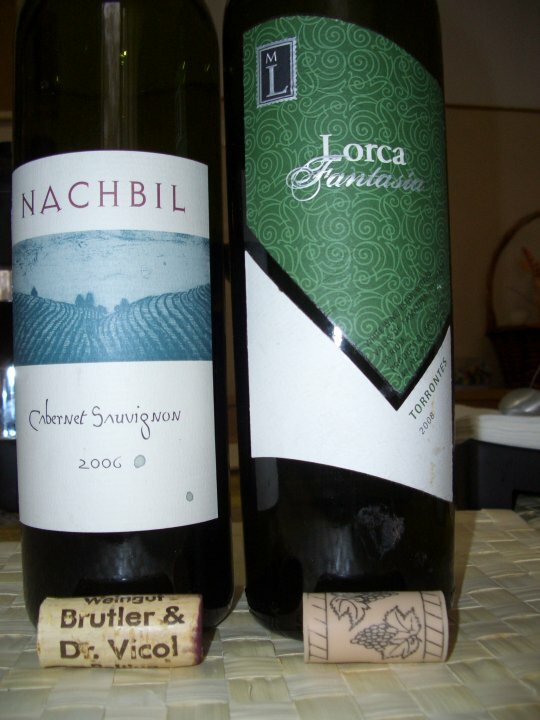 What surprised me was how Bulgaria has two world known and famous winemakers producing International wines and in Romania the awards for the best wines still go to sweet wines, as if we are caught in a Catch 22 story. There is also a funny story about the first arrival of Mr Rolland in Bulgaria. 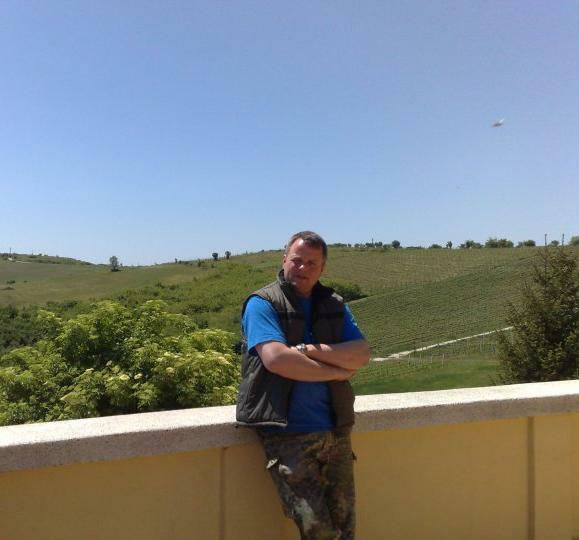 It seems that as soon as he landed at the airport for the very first time, even before he got the chance to pick up his baggage, he had an envelope waiting for him with a business proposal to consult for a Bulgarian vineyard. It seems that it was one of those offers you cannot refuse as he is now consulting for the vineyard there. Marc spoke about his work at Enira and also about other ventures he consults for. At Enira the 2006 wines are already showing a great potential for what Bessa Valley can offer: both Enira and Enira Reserva 2006 are good wines. Because the vines are very young, in 2006 they produced wines with a very high level of alcohol.Initially over 15.3%, they lowered the alcohol levels so the wines can remain balanced. The wines still have 14.5% and 14.7% alc for Enira and Enira Reserva but this is very nicely balanced. In 2007 as the vines managed to go deeper into the soil they didn’t have the high alcohol problem anymore, the wines achieving 14.3-14.5% alcohol levels naturally. The Reserva 2007 is still kept in concrete vats after spending 15 months in 30% new oak and should be bottled in June. 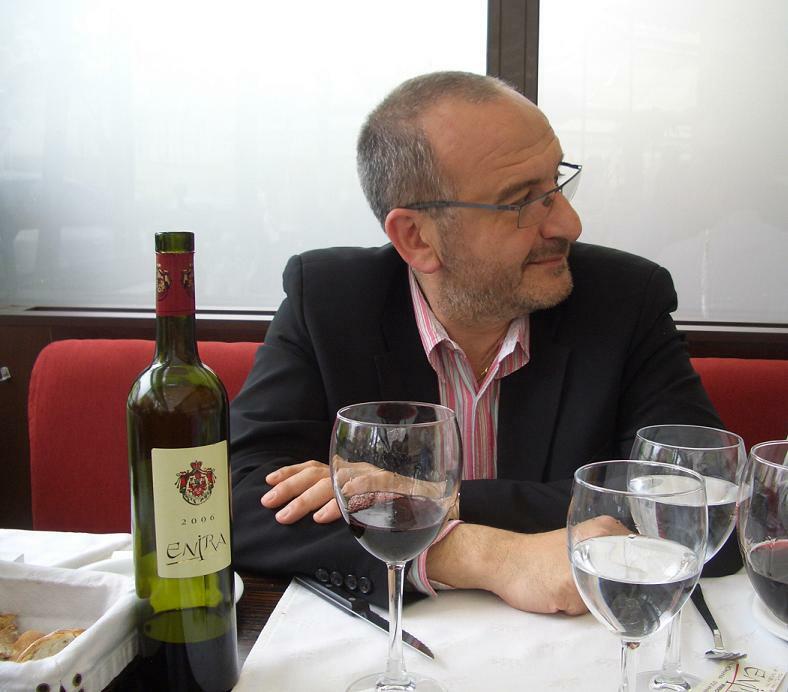 I asked Marc which vintage he considers to be the best produced so far at Enira and he replied that 2009 and especially the Syrah 2009 that has “an amazing color and concentration”. He is very confident about the new venture started in Romania at Aliman and considers that as long as you have a strict discipline in the vineyard, technology (using a server based system that enables him to monitor the temperature and density from the tanks via Internet; he is looking to install this system for all their wineries) and the terroir is good, you have the recipe for successful International wines. We, the consumers, can only wait and hope he is right. Marc is currently involved in a project in China. Great River Hill winery has been established with Laixi city with initial plantings of 16 hectares of Cabernet Sauvignon last spring and will be supplemented by a further 84 ha of other varieties while a winery is built. The main partner is Dr Karl-Heinz Hauptmann, co-owner of Bessa Valley in Bulgaria with Stephan von Niepperg of Chateau Canon la Gaffelière in St-Émilion, with practical expertise from Marc. Marc has also a participation in this joint venture. The first wines are expected in 2012. Marc is extremely bullish on the Chinese market as he confessed that this will assure his retirement. This should give us an idea about the potential of this new market. During our lunch conversation he told me a little bit about his family and how he balances his private life. He travels over 200 days per year. His wife is working for Domaine Clarence Dillon and she is also a winemaker, blending some of the mid-priced wine Bordeaux brand Clarendelle, something similar to Mouton Cadet. Domaine Clarence Dillon owns Chateau Haut Brion and Chateau La Mission Haut Brion. 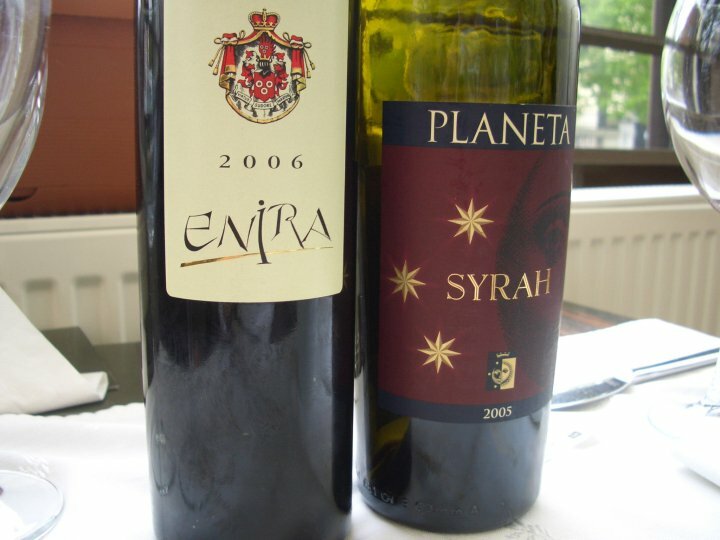 We tasted together two wines: Enira 2006 and Planeta Syrah 2005. I found Enira to be a better and more complex wine. I am very glad I had the chance to meet Marc. I am sure we will meet again with other occasions as he confessed he likes to participate at tastings together with people from local media and wine lovers. Marc left me explaining that he already missed four days of vacation with his family and after the 8th of May he will be traveling between Europe and China. I guess being an International winemaker is not only milk and honey. I am a big fan of Chateauneuf du pape wines. I like these wines because they are not insanely priced and they offer tremendous quality. This area has a particular place in French wine history, because it was here that the very concept of Appellation Controlee was founded. There have been some exceptional vintages in Chateauneuf du Pape with many wines receiving 100 points from Robert Parker Jr, more wines in an appellation than many other regions in France. Parker was actually the biggest promoter of this area from the Rhone valley and many consider that both the man and the area grew famous together. I know that Mr Parker seems to be the roots of all evil today, but when it comes to Chateauneuf he was right the whole nine yards. Recently a gentleman from Netherlands has dedicated time and great effort, and produced the most comprehensive encyclopedia of the whole Chateauneuf du pape region describing the wines, the people and everything that is to know about it. The author’s name is Mr Harry Karis and the book is called “The Châteauneuf-du-Pape Wine Book”. Coming back to the wines and quoting Mr Karis: 2004 produced wines that are drinking very well now, the closed 2005s need 6h prior decanting, the flamboyant 2007s are closing now and 2006s are very enjoyable with a couple of hours of decanting. Many say that Chateauneuf wines are to be drunk only after at least 5 years from their release, but these wines can last for decades. The bottle I had, even though not coming from a famous producer from the area, delivered great pleasure on a quiet SUN lunch at home. 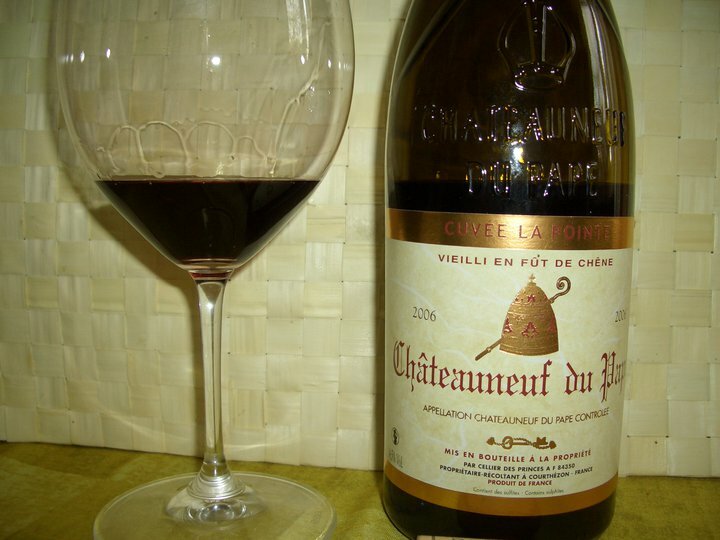 The 2006 Cuvee la Pointe Chateauneuf du Pape made by Domaine des Florets is a big and fat wine. I drank this wine over two days. The 1st day the wine showed more fruit. The wine has an oily appearance, leaving a lot of legs on the side after swirling the wine in the glass. These normally suggest either high alcoholic content or residual sugar. In the glass the wine shows the first: 14.5% alcohol, very common for these Grenache based wines. The color is deep, almost opaque dark red. The nose is clean, with a medium plus intensity, developing red fruit aromas: sour cherries, almost jammy, raspberries, a discreet dairy note, meaty flavors, earth and a hint of tobacco. In the mouth this wine is BIG, showing red fruits: sour cherries syrup, raspberries and strawberries, dried fruits: fig, spices: black pepper and eau de vie, with high acidity that perfectly balances the high alcohol and the firm tannins.. The aftertaste is long, finishing with red fruits flavors. The 2nd day the wine evolved nicely towards strong flavors of black olives, truffles and even game on the nose, no longer the fruits from yesterday. I love this nose. The wine maintains its long aftertaste finishing with black olives and dark chocolate with a very discreet sweet note. I was surprised how beautiful this amazing wine evolved over these 2 days. This was an excellent bottle of red Chateauneuf du pape wine. Price was around 30-35 €. Serve this wine with big food and make sure to decant at least 1-2h before serving. Sauternes AC lies on the west bank of the Garonne, upstream from Graves in Bordeaux. The appellation is only given for sweet white wines; if the wine is dry, it has the right to no higher appellation than Bordeaux AC. The wine has a clear deep amber color. The nose is clean, medium intensity, with mineral aromas and stone fruits. In the mouth the wine is creamy, lusciously sweet, has medium acidity, full body, with fruit notes: apricot and peach, vanilla, honey and caramel. The aftertaste is medium plus. This wine needs more acidity to balance the sweetness. It is a decent wine that can be paired with foie gras and blue cheese. I tasted previously the Esporao Reserva 2006 which is the top cuvee from this producer and for 15 € it was a nice bottle of wine. 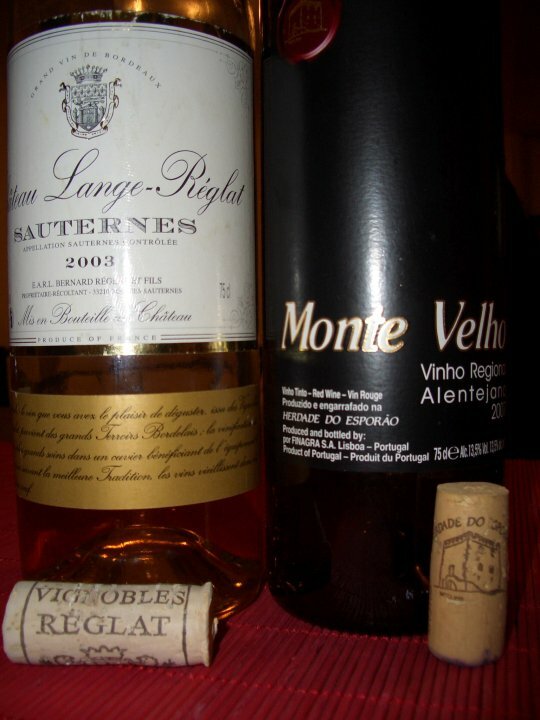 The 2007 Monte Velho was a real disappointment. The wine has a medium red color and is watery like. 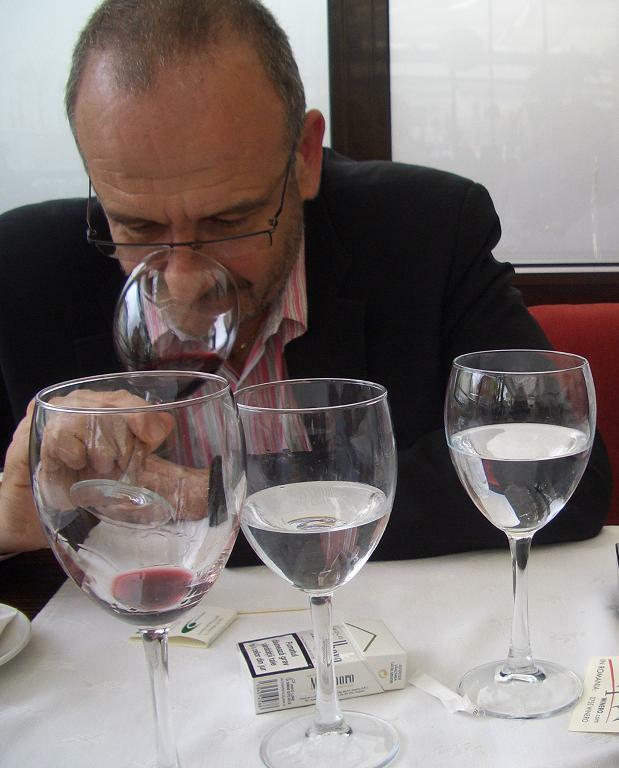 The nose is dominated by alcohol. Even after 1h in the glass, alcohol was still dominating the nose. There are some red fruits far in the background. 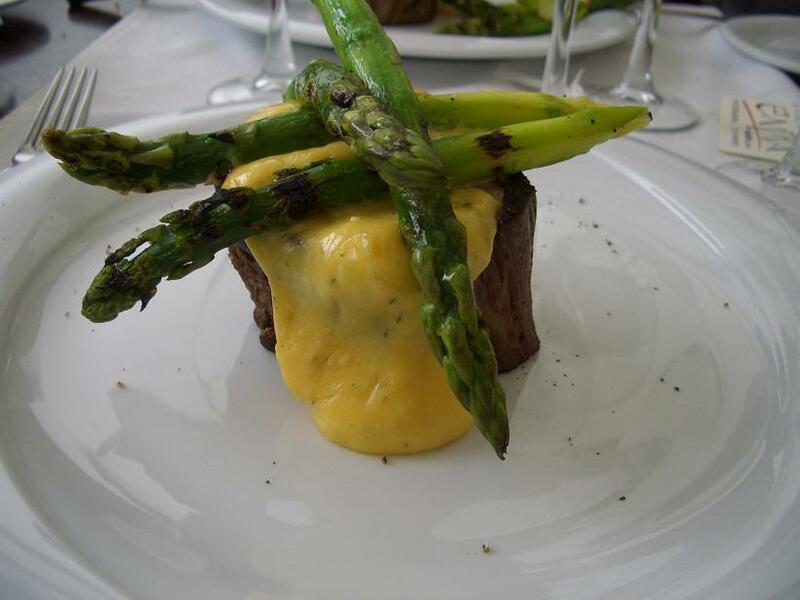 In the mouth the wine reveals some discreet red fruits aromas and again more alcohol. I don’t think this wine has any after taste; the only thing leaving behind is the alcohol. A real disappointment.